BUSHENYI/HOIMA, (IRIN) – At least 2,500 farmers in the western districts of Uganda are earning extra cash to boost their livelihoods by planting trees alongside their crops in a scheme that is helping to sequester carbon dioxide. Trees process huge amounts of carbon dioxide because of their size and extensive root systems making them efficient carbon sinks. Under the Payment for Ecosystem Scheme, a farmer who plants one hectare of mahogany, prunas africana or maesopsis local tree species will on average earn US$700 a year, said Annet Ssempala, a programme officer with the Environmental Conservation Trust (Ecotrust). Ecotrust’s donors include the US Agency for International Development and the World Wildlife Foundation. Funding for this project is provided by Plan Vivo Foundation. “That’s on average per hectare but other farmers are earning more than that,” said Ssempala. An assessment of the size of land a farmer has under trees, the type/species of trees planted, the vegetation cover of the trees and the maturity period, helps to determine the amount of money each farmer will earn. The farmers are paid in five instalments over a 10-year period receiving 30 percent of the payment in the first pay-out and 20 percent in the second, third and fifth pay-outs, respectively. A 10 percent payment is made at the fourth pay-out. Through this carbon credit fund, annually the farmers are collectively earning about $500,000 and obtaining certificates of engagement that are enabling them to access credit, according to Ecotrust. Benon Bushoborozi of the Kiyanga tree planting group told IRIN he has been able to obtain a 500,000 Ugandan shillings ($200) loan to finance his farming activities. “The money helped me start my vegetable project last year and I was able to pay back the money after selling my vegetables,” he said. 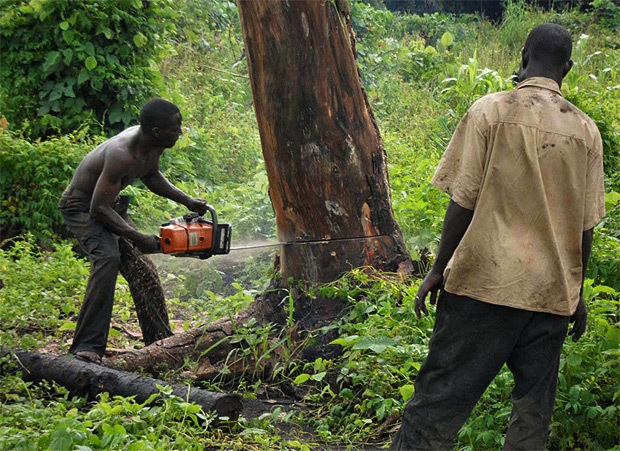 “Unscrupulous loggers are cutting down forests indiscriminately for timber or fuel with impunity. We are planting trees to conserve the environment,” said Beatrice Ahimbisibwe, a member of the Bitereko women’s group in Bushenyi District. Ahimbisibwe told IRIN she has planted three hectares of exotic pine and indigenous tree species on her land. “They [the local and central] governments aren’t doing enough to preserve forests and [the] surrounding environment,” she said. Working alongside Ecotrust is the Trees For Global Benefit project (TFGB) through which farming groups are not only benefiting from trade in carbon credit but also helping to restore the depleted forest cover. According to Tom Rukundo, an environmental impact assessment and research specialist at Uganda’s National Forest Authority, the lack of incentives to preserve forests has been largely responsible for deforestation. “The situation has been made worse by the growing fuel demand and an incapable forestry institution struggling with limited resources,” he added. Rukundo said there is a need for forests outside protected areas to have incentive schemes such as the Reduction in Emissions from Deforestation and Forest Degradation, which pay people to preserve their forests to mitigate the effects of climate change. “Wildlife like chimps [chimpanzees], buffaloes and birds, that previously had plenty of room to roam, now pillage crops and compete with humans for territory,” said Yolamu Nsamba, a former secretary to the King of the Bunyoro Kitara Kingdom in Hoima, commenting on the degradation of the Budongo and Bugoma forest reserves in Hoima District. Forests there were in the past conserved by traditional authorities.